The AP3935 is a feature rich 802.11ac (Wave 2) and 802.11abgn indoor access point that delivers enterprise-grade performance and security. Designed to blend into the office, classroom or lecture hall, or large common spaces, the AP3935 is ideal for providing secure 802.11ac and 802.11abgn connectivity for high-density, mission critical environments such as schools, universities, hospitals, indoor arenas, and conference centers. The AP3935i comes with an integrated eight port antenna array for ease of installation. The AP3935e requires professional installation and includes eight Reverse Polarity Sub-Miniature Version A (RPSMA) antenna connectors supporting both 2.4GHz and 5GHz band antennas. The AP3935 uses 802.3at Power over Ethernet (PoE+) for maximum performance and can operate within an 803.2af power budget with reduced performance. An optional external power supply is available for deployments that do not support Power over Ethernet. beamforming, multi-user MIMO, self-forming and self-healing meshing, security, role-based authentication, authorization, and access control. The 4x4:4 platform is capable of delivering up to 2.5 Gbps over-the-air-performance and up to 90,000 packets per second on the wire port. The AP3935 can be installed directly on a flat surface or on most drop ceilings with the included tool-less drop ceiling bracket. 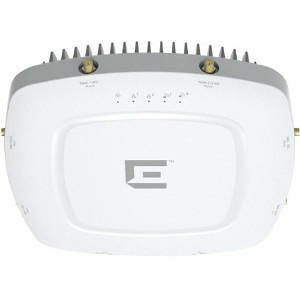 Multiple antenna offerings (e.g., Omni, sector, and panel) ensure that the AP3935e deployment can be optimized to meet any unique coverage or capacity need.